Yngwie Malmsteen is one of the more notable to play in the neo-classical style of metal that had its peak in the 80s. And many of his songs feature fantasy based themes. 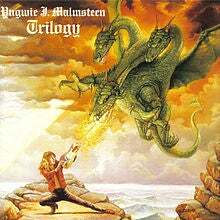 The album cover for Trilogy (image shown) even has him fighting a dragon, with his guitar of course. Mostly I just wanted to post a few of this guitar virtuoso's songs because he's amazing. If you've seen Bill & Ted's Excellent Adventure, it might remind you of Beethoven playing keyboard in the mall (it did for me anyway).